Hash records and statistics files can be downloaded from this page to your device by clicking on the links below. Once downloaded, obviously you must have the relevant applications in order to view them! More digital records are stored on the ISP server available to those of the QH3 Mismanagement Committee who have access to the server. Harelines for about 10 years have been created in MS Excel though from 2014 the hareline has been created as an XML database for ease of integration with this web site. Harelines have been combined into a single 'all time runlog' available below as either a MS Excel file or a pdf. The initial work on creating this was done by Bugger but updating and editing has continued by Durex. This has involved searching through paper copy scribes, photos and talking to some of the old time hashers. There are no doubt some errors and missing run information, particularly from the early days. Please let us have any contributions to improving this list. 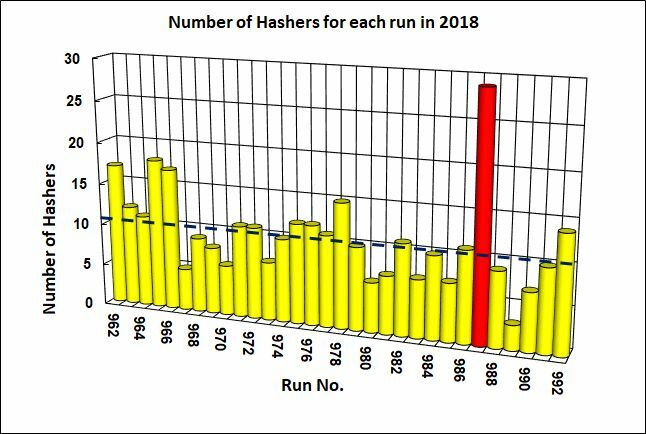 In recent years Hash Cash has kept Excel spreadsheets made from the written listings of hashers attending runs. As part of the Hash Cash Excel files, a record of hasher run and haring totals are kept. A pdf summarising these statistics up to Run 961 (end 2017) are given on this page. Durex has georeferenced entries in the 'all time run log' (based on postcodes) so maps can be made of the On Inn locations that can be viewed in Geographical information systems (such as google earth). Some of these maps and files are made available below. Note that GPS traces of hash trails for several years were published in the East Midlands Hasher Blog until the end of 2016. QH3 records exist in many forms. Until the late 1990s these are non-digital formats - Hash newsletter/scribes, photos and handwritten hash cash records. These are currently scattered amongst former and current hash members. Some of these hardcopy records have been scanned (e.g. a few scribes and photos) but largely are inaccessible and at risk of being lost. Digital Hash Cash records in the form of Excel spreadsheets date back to the end of 2002 and are currently in the care of the present Hash Cash Durex. From these hasher run and haring totals are calculated though comprehensive summations where last done to the end of 2008. More recent summaries tend to focus only on active members or for reporting to the Annual awards night. For several years run scribes were published on the East Midlands Hasher Blog (until end of 2016) along with a few photos and GPS map links when available. Other photos are posted to the QH3 Facebook group. Some reports, records and photos are archived on the hash ISP server for safe keeping - these are only accessible to those with permissions to access the QH3 server storage.